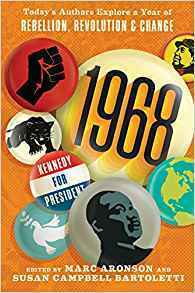 Written about the pivotal year of 1968: the Vietnam War, the deaths of Martin Luther King Jr. & Robert Kennedy, the rift between generations. It was a year that changed our country dramatically. This book was written by different authors in varying styles. The first story begins in January 1968 and it proceeds through the year from different viewpoints. As with any book written by so many authors, there are high points and low points. Some write their stories as a memoir, others give more of a global view. The book is great due to its topic; it is a time of history that everyone should learn at least a little bit about. The writing takes some getting used to, but in the end it is worth adjusting to it. It is a brilliant way to see the era from different viewpoints.